Today marks the release of Batman: Arkham Knight, a title many fans of the franchise have been looking forward to for quite some time. It marks the series’ first appearance on the current generation of systems, and has easily been one of the most-anticipated titles for the first half of the year. percent of what the game considered “Story Mode Completion,” which is surprising considering how much the game throws at you as it unravels. On top of the overlying confrontation with the game’s primary nemesis, plenty of other Gotham City staples will cause troubles over time, resulting in a number of side quests to tackle. For those who haven’t checked out a game in the Arkham series yet, my experiences with the title have yielded a lot of enjoyment as they place a focus on Batman’s detective chops. While the fisticuffs are certainly present in the series, they aren’t necessarily the focus as they have been in past games. This series is rooted in what makes the Batman character – his billionaire utility belt, uncanny deduction skills and stealthy nature. The game encourages the use of stealth, but, unlike other stealth titles, I’ve hardly considered the times I was detected unfair. Still, if Batman is detected, in most cases he can handle himself in combat. However, there are some cases where the numbers game and heavy firepower really discourages diving straight into combat and some instances will put Batman at a disadvantage as enemies can act out on a threat (such as killing a hostage) if he is discovered. Arkham Knight introduces even more tools for Batman, but, in kind, the enemies have also evolved, making for an even more interesting progression in the series. Those who have played a game in the series, won’t find too many shake-ups to the core mechanics. The story writing, character representation and fan service is still there, and the control scheme will feel very familiar. Running on the Xbox One, the details have been amped up, resulting in a great, dark presentation. 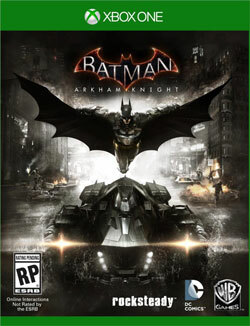 Arkham City took the series into a more open-world approach, and this is carried into Arkham and amplified by the introduction of the Batmobile. At a simple glance, it may appear the vehicle is just thrown into the game to cover roadway, but intelligent design has the Batmobile rocking just as much technology as Batman himself. Simply holding the left trigger converts the vehicle into a strafing tank for third-person shooting skirmishes, collecting a hook upgrade allows the vehicle to scale buildings or pull down weak structures and, of course, the vehicle can be upgraded just like Batman. Players can also eject from the vehicle and shoot skyward, which, along with Batman’s grappling hook, allows the player to quickly navigate the city. And, when you need it most, remote access allows players to instantly call the vehicle to their location or control it from an entirely different location. The game progression balance has also been satisfying up to this point as well. The focus keeps changing from fighting to navigating, to solving puzzles to driving/vehicular combat. It keeps up a pace and has prevented me from getting burned out on the game thus far. So far, Arkham Knight has been one of the better retail titles I’ve played so far in the year, and I’m looking forward to seeing what more the game has to offer. Rocksteady Studios has continually evolved the franchise from its first entry, and more smart decisions keep the series from becoming stale.